How I Remember It: I sat somewhere around the 15-yard line of the south end of the stadium on the Auburn side. It was cold. All of the lights in the stadium went out at some point. Auburn gave up a big lead, and a last second, tying touchdown, to play in the SEC’s first overtime (four, to be exact) game ever, and lost when Dameyune Craig was tackled one yard short of a first down. 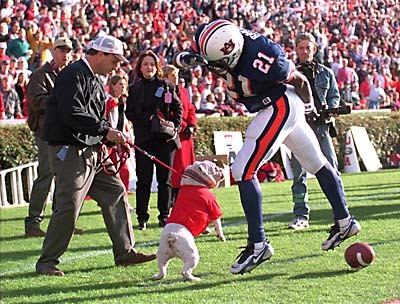 What Really Happened: Dameyune Craig threw three first half touchdowns, two to Robert Baker (who had to dodge a bite from UGA), as the Tigers took a 28-14 lead into halftime. Neither team would score in the 3rd quarter, as Auburn seemed to have control of the game. Early in the 4th quarter, Georgia quarterback and current offensive coordinator, Mike Bobo, connected with Hines Ward for a 67-yard touchdown. Then with one second on the clock, he threw a 30-yard touchdown pass to Corey Allen, who seemed to catch the ball right on the goal-line. Here’s video of that terrible play, if you would like to watch. This happened right in front of me, so you have to watch if it I did. In the first overtime in SEC history, both teams would score a touchdown on each possession of the first three overtime periods. Georgia took a 56-49 lead in the 4th overtime, with a 1-yard touchdown run. Then on 4th-and-3 from the 18-yard line, having to score or at least gain 3 yards to continue the game, Dameyune Craig was tackled one yard short, ending the game at 56-49 Georgia. Fun Facts: This game was the 100th meeting of the Deep South’s Oldest Rivalry. Why did I pick this game? Although Auburn lost a 21-point lead to a Georgia team that had only won three games so-far that season, it was a great game to watch. The first SEC overtime wasn’t no missed field goal/made field goal affair. It was a four overtime, seven-touchdowns-after-regulation, wow this overtime thing is really cool affair. It was a heart-breaker, but it had to make the list. Player of the Game: Dameyune Craig’s threw three touchdowns in the first half and rushed for two in overtime. This game was emotionally draining. It started at 2:30 and ended about nine. Was standing right next to Uga when he almost bit Baker. I was also right there when Georgia caught the td to tie the game. If charles Dorsey doens’t pick up the ball on third down claiming there was a fumble, the clock runs out and we win. I was on my knees after regulation on the sidelines. Coach Allison asked what was wrong and I said we just blew the game. The worse part of the whole game was I had two room mates from georgia and all of their friends were in town for the game.